The glazing industry is highly competitive. When you want to grow your business, it’s important to budget accordingly. At Roseview Windows, we fully understand the difficulties facing window installers in today’s market place. Whether your installations are mainly replacement window projects or new build installations, we can help your business to become a complete success. At Roseview Windows, we manufacture the industry leading Rose Collection. The Rose Collection is a suite of bespoke high performing and aesthetically authentic uPVC sash windows. Consisting of three different models, the Rose Collection has something for every installer, whatever your budget. The three models in the Rose Collection provide both installers and their customers with a variety of benefits. Let’s take a closer look at the characteristics of each option and where they are placed in terms of price. The Charisma Rose is our most competitively priced window option. Manufactured using a sculptured Eurocell profile, it is perfect for both new-build projects and commercial installations. The Charisma Rose features ovolo detailing and is available in a range of authentic woodgrain finishes. It is ‘A’ rated for thermal efficiency and functions on a smooth sliding and durable torsion balance system. The Heritage Rose is designed to faithfully replicate the appearance of a traditional timber sash window. Manufactured with the slimline Rehau Heritage VS profile, it’s sightlines are some of the slimmest available today. The Heritage Rose features a wealth of period detailing including deep bottom rail, traditional furniture and putty line profiles while providing the high levels of thermal and security performance expected from a modern uPVC window. The Ultimate Rose is our leading sash window option. It is the outstanding option in terms of both performance and aesthetics. Its 35mm meeting rail is, quite simply, the slimmest on the market. Combine this with a plethora of period detailing and unashamedly modern levels of energy efficiency and security standards and you’ll soon see why the Ultimate Rose is the envy of the glazing world. In a highly competitive market, it’s imperative to give your customers the best products and a professional service every time. 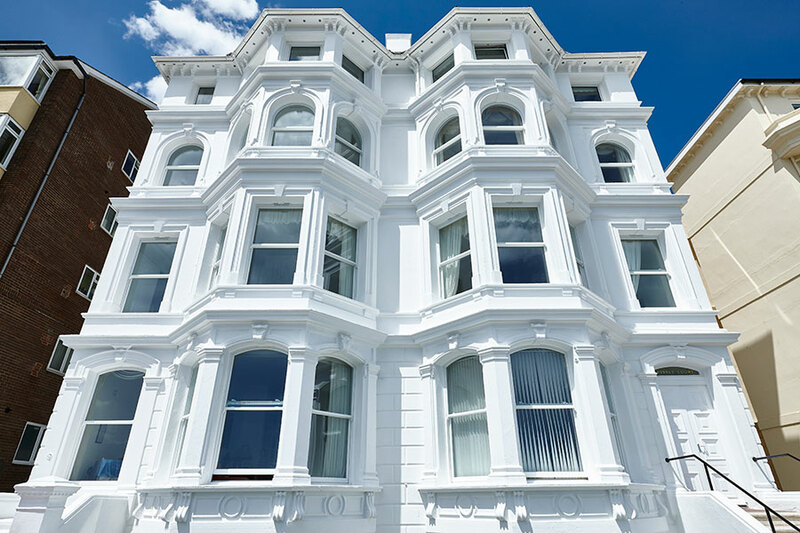 Take your business to the next level with our outstanding offering of trade uPVC sash windows. If you’d like to find out more about working with Roseview Windows, contact us today. Give us a call on 01234 712 657 or send us a message online.